Cary, NC – We are one month into the new year and many of those New Year’s Resolutions have gone right out the window haven’t they? You were going to get organized, be more focused and maybe drop a few pounds, right? How about a simple goal? One that we adopted this year: to eat more healthfully. Not changing everything, but just be more mindful when we make a meal, and actually vowed to eat home more often, because, let’s face it, when you eat home, the portions are human-sized and you know all the ingredients and can keep a lid on the calorie count. To that end, we have been posting photos on our social media accounts (Facebook and Instagram) about what we’ve been making for breakfast and dinner – the two meals we are most often home for. The drink itself. Note the metal straw. But that’s another blog post! Today, I made an awesome smoothie which took all of five minutes to make and even less to drink! Everyone has time to make this and with the added protein, it will keep you full until lunch, when most folks eat out and are tempted to go off the healthy plan, especially if you eat with your co-workers. But that’s another conversation. I have been reading a lot about how most smoothies are loaded with calories and fruit purées and can pack a walloping 600 calories or more! Frankly, not healthy. The current trend is to include some grains to add some roughage or protein to add bulk to the drink, which will keep you full longer. That way, you don’t feel like you need a sandwich two hours later. 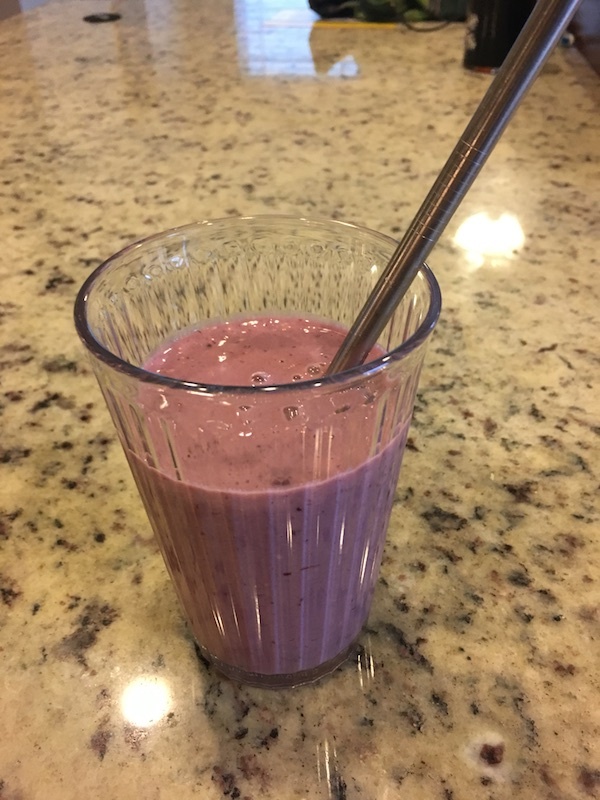 Here’s what I made this morning: a Blackberry Mango Smoothie with greek yogurt and granola. Delish!